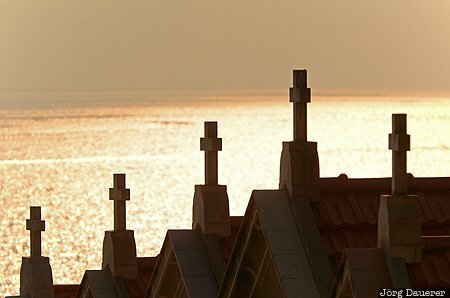 The silhouettes of back-lit crucifixes of the typical above-ground tombs in the cemetery of Ajaccio with the water of the mediterranean sea in the background. Ajaccio is the capital of the mediterranean island of Corsica, France. It is in the department of Corse-du-Sud. This photo was taken in the afternoon of a sunny day in September of 2011. This photo was taken with a digital camera.